Photograph of Joseph Francis Mather, Tasmania 1844-? Mather, Joseph Francis , Photograph of Joseph Francis Mather, Tasmania 1844-? , University of Tasmania Library Special and Rare Materials Collection, Australia. 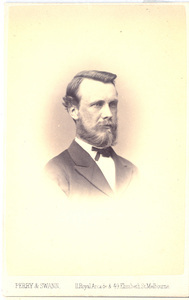 Photograph of Joseph Francis Mather (known as 'Frank') born in 1844, only son of Joseph Benson and Anna Maria Mather.